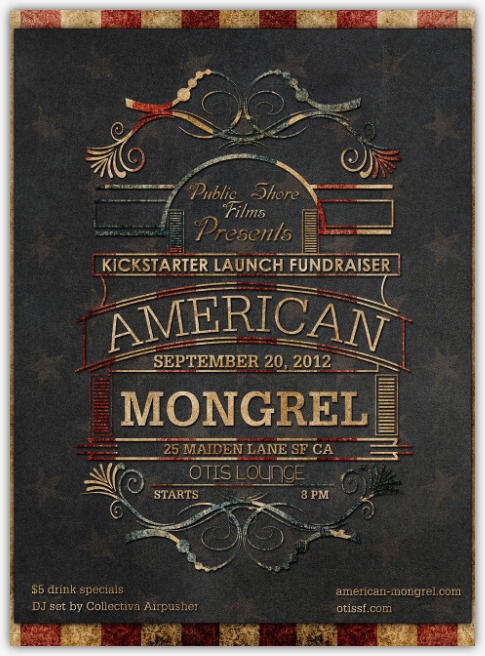 We launched our Kickstarter.com campaign on September 20th with a kickin’ party at the Otis Lounge in San Francisco. The campaign is critical for the completion of the film, and the very nature of Kickstarter is “all or nothing”. We are looking to raise, at minimum, 45,000 dollars, which will go towards editing, color correcting, audio mixing and distribution — and the submission process for film festivals around the world. We have some great perks for different pledge levels, as well. Make sure to check out the video first, which explains why we need your help, and also lets you see some of the film footage and meet the characters. Here’s the link. If we don’t reach our goal of 45k, you will not be charged once the campaign ends on October 20th. If we do, it’s because of your help. Peace, from the entire American Mongrel cast & crew.